Anissa Helou is a Chef, Cooking Instructor, Culinary Researcher, Food Consultant, Food Writer, Middle Eastern Cuisine, and a Writer. 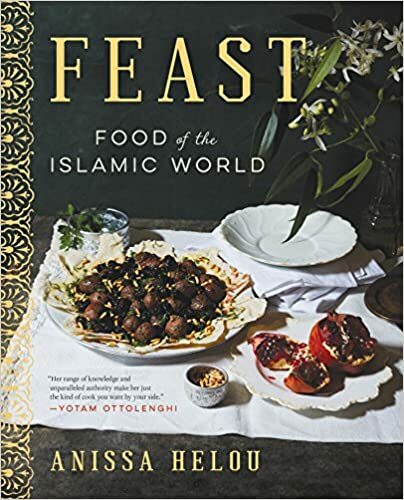 Her new book is entitled Feast: Food of the Islamic World. Her Instagram material can be seen here. She discusses: the appointment as Sotheby’s representative for the Middle East; transition into owning and running an antique shop in Paris to sell objets d’art and furniture; personal and professional lessons from the work as Sotheby’s representative for the Middle East and owning an antique shop in Paris; the most memorable sale from running the antique store; the 1978 to 1986 period in Kuwait as an advisor for multiple members of the Kuwaiti ruling family; skills developed in the midst of work in these three domains: representative for the Middle East, ownership of a shop, and advisor to the ruling family; distinguishing Islamic art from other art; various collectors about the purchase of “Victorian paintings, European silver, jewellery and Arts and Crafts furniture”; the Kuwaiti family members worked the closest with; most touching experience; distinguishing Victorian and European art from other art; “Aladdin’s cave”; and selling the house. Keywords: Anissa Helou, chef, cooking, culinary arts, food, Middle Eastern, writer. Anissa Helou was born, the daughter of a Syrian father and a Lebanese mother, in Beirut and educated there at a French convent school. Aged 21, she moved to London to escape the rigid social convention of her country and began to study interior design at Inchbald School of Design then at Sotheby’s training course, the history of art. She was soon appointed Sotheby’s representative for the Middle East. For a while thereafter, she owned and ran an antique shop in Paris, dealing in furniture and objets d’art which reflected her own sophisticated and highly individual taste. From 1978 until 1986 she was based in Kuwait and was adviser to several members of the Kuwaiti ruling family who were then forming collections of Islamic art. She also advised these and other collectors on the purchase of Victorian paintings, European silver, jewellery and Arts and Crafts furniture. During this period she travelled extensively and she also started to build her own very personal collections. On her return to London in 1986, she housed her collections in her Victorian house transforming it into an Aladdin’s cave of beautiful and often bizarre treasures. What instigated the appointment as Sotheby’s representative for the Middle East? Anissa Helou: The fact that I was Arab, spoke Arabic, was well connected and had successfully completed the Sotheby’s Works of Art Course which in those days was a form of training for later recruitment by the firm. 2. Jacobsen: How did this transition into owning and running an antique shop in Paris to sell objets d’art and furniture? Helou: I have always been very independent and I didn’t particularly like to work for a corporation however prestigious. Also, I was too early. Arabs were not interested in buying art and Sotheby’s were not willing in investing to promote themselves there so I wasn’t achieving much and I preferred to go it on my own. This said my antiques shop in Paris was a total disaster and I lost almost all the money my father had given me for it. I was only 24 with no experience in business, and no taste for it really. I just loved beautiful things and thought people would just buy what I liked at any price but they didn’t. And I had opened in Les Halles thinking that the area would develop into a cool place but in fact it didn’t. Quite the opposite. So I switched to becoming a free lance consultant and I was pretty successful at that. 3. Jacobsen: What different personal and professional lessons came from the work as Sotheby’s representative for the Middle East and owning an antique shop in Paris? Helou: So many but the most important were that experience and hard work are essential. And in those days I had neither, I was too young and I was more interested in enjoying the good life and all that Europe offered me than to hunker down and work very hard. 4. Jacobsen: What seems like the most memorable sale from running the antique store? Helou: When I sold a pair of appliques (I think) to a decorator who was buying them for Jean Marais. It was very exciting. 5. Jacobsen: In the 1978 to 1986 period in Kuwait as an advisor for multiple members of the Kuwaiti ruling family, in their formation of collections of Islamic art, what items come to mind in reflection on the 18-year period? Helou: Many fine Islamic art objects and some beautiful minor pre-Raphaelite paintings including one by Marie Spartali Stillman – there was a show of her work in London recently but in those days no one knew her – and starting my fishing collection because I was also collecting but obviously on a much smaller scale as I had no money to speak of. 6. Jacobsen: What skills developed in the midst of work in these three domains: representative for the Middle East, ownership of a shop, and advisor to the ruling family? Helou: I only advised a few members of the ruling family, and as their consultant I developed a skill for advising my clients gently as to what would be good pieces for them to collect. I also developed a skill I developed for negotiations with dealers as I was looking to buy the best price possible. 7. Jacobsen: What distinguishes Islamic art from other art to you? Helou: There is a connection to where I came from, in particular to the Islamic art that comes from Syria as well as that which comes from Egypt and Turkey. 8. Jacobsen: In addition to the Kuwaiti family art collections ongoing at the time, you worked with various collectors about the purchase of “Victorian paintings, European silver, jewellery and Arts and Crafts furniture.” Where did the expertise in these various specialist collector areas come from for you? Helou: Without sounding immodest, I had a very good eye and good taste although tending to the quirky in paintings and on the Sotheby’s Works of Art course we learned primarily to look at art to appreciate quality and this came in in very good stead when I became a consultant and a collector. I also could spot the quality in objects that seemed undesirable at the time and have since become very desirable like my treen collection, or the fishing collection. I also had friends and colleagues who were specialists and I sought their advice when I wasn’t sure of something. 9. Jacobsen: Of the Kuwaiti family members, who worked the closest with you? Helou: Some of the daughters of the late Sheikha Badriyah who if I am not mistaken was the first business woman in Kuwait. 10. Jacobsen: What experience most touched your heart in this period of life? Helou: My antiques shop in Paris was in the heart of Les Halles, very near la rue St Denis which in those days was still full of prostitutes. My father and my mother came to visit soon after I opened the shop. My father always wore a hat and carried worry beads and he loved walking. So they came into the shop, more or less liked it – neither were really interested in antiques – then my father decided to go for a walk. He came back absolutely shocked. He couldn’t imagine his daughter working in such an unsalubrious neighbourhood, and with his hat still on and clicking his worry beads, he would look at me, shake his head and ask: ‘how could you do this my daughter’ referring to opening a shop right next door to a prostitute street. I think he went round the block half a dozen times, and returned with the same pained expression and puzzled question. I remember that moment with amusement and tenderness on how naïve or strict my father was, but also how loving because apart from questioning my wisdom in opening my shop in this neighbourhood he didn’t scold me or tell me to close the shop and move to a better neighbourhood – in those days Arab fathers were really strict with their children and felt they could dictate to them whatever they felt was good for them but my father was strict but once we made our choices however questionable, he let us do what we wanted. 11. Jacobsen: What distinguishes Victorian and European art from other art to you? Helou: The answer would be too long and complex and I don’t think I could really express it within the context of this interview. 12. Jacobsen: In London, 1986, you brought collections to the Victorian house. Your house became Aladdin’s cave, according to the description. What parts of the collection remain with you to this day (if any), or remain the most precious and close to your heart? Helou: I loved both my treen collection and the fishing one. I have very few objects that remain with me but most have been sold but if I could rewind the clock I would have liked to keep the fishing cases with the display of fishing tackle but on the other hand I really like the way my space is now, totally uncluttered and serene so no regrets really. I loved my objects when I had them and enjoyed them when I remembered to look at them properly but I don’t miss them now. 13. Jacobsen: Of course, you had the spring, 1999 moment in personal (and professional) life. You sold the house and collection at Christie’s. What brought about this need for dramatic change to sell the house and its associated personal collection? Helou: I hate routine and I get bored easily and am always looking for ways to make my life more interesting. Recently I thought about why I felt the need to change my life dramatically every few years, and I thought that maybe it has to do with the fact that I don’t have a family. People with children naturally go through changes as the children grow up and leave home, get married, have their own children. I guess I provoke the same changes in my own life but as a single person. It is also a way to stay curious and energetic with each new phase. [anissa Helou]. (2015, January 15). anissa making tabbouleh 08. Retrieved from https://www.youtube.com/watch?v=Owtn2IoT_vw. [AP Archive]. (2015, August 3). Egyptian street food arrives in London. Retrieved from https://www.youtube.com/watch?v=lKE8XOrSfGA. [Canongate Books]. (2014, September 3). Anissa Helou’s Middle Eastern Meatballs. Retrieved from https://www.youtube.com/watch?v=ZFhdtbRTdCM. [Canongate Books]. (2014, March 8). Chefs who inspired Signe Johansen and Anissa Helou to cook. Retrieved from https://www.youtube.com/watch?v=pMNaSmt2Ths. [discoverspice]. (2013, March 30). Anissa Helou – art, passion and the Mediterranean!. Retrieved from https://www.youtube.com/watch?v=VTWWOfprVp8. [Firehorse Showreel]. (2012, August 6). El Chef Yaktachef – Episode 9. Retrieved from https://www.youtube.com/watch?v=ZMt-xxkN2jA. [QatarUK2013]. (2013, November 26). Evenings with Aisha Al-Tamimi and Anissa Helou: Dishes from Qatar. Retrieved from https://www.youtube.com/watch?v=RdAadHJGfwg. [SallyB2]. (2013, February 20). Anissa Helou On Koshari, And The Rise Of Middle-Eastern Cuisine In London. Retrieved from http://londonist.com/2013/02/koshari. [sbsarabicvideo’s channel]. (2010, October 26). Karabij and Natif with Anissa Helou. Retrieved from https://www.youtube.com/watch?v=K8iYQWppLUA. [Sharjah Book Fair]. (2011, December 26). Anissa Helou at Sharjah Book Fair 2011.wmv. Retrieved from https://www.youtube.com/watch?v=iZMYSmzJ_58. Arabian Business. (2013). Anissa Helou. Retrieved from http://www.arabianbusiness.com/100-most-powerful-arab-women-2013-491497.html?view=profile&itemid=491348#.UVrfMasaeDk. Arabian Business. (2013). Anissa Helou. Retrieved from http://www.arabianbusiness.com/arabian-business-power-500-2013-493796.html?view=profile&itemid=493832#.VtRbRZwrKM-. Christie’s. (2016). Christie’s. Retrieved from http://www.christies.com/. Derhally, M.A. (2013, May 2). Anissa Helou interview: Accidental Cook. Retrieved from http://www.arabianbusiness.com/anissa-helou-interview-accidental-cook-499915.html. Helou, A. (2016). Anissa Helou. Retrieved from http://www.anissas.com/. Helou, A. (2014, June 8). A Taste of Syria, In Exile. Retrieved from http://www.newsweek.com/2014/06/13/taste-syria-exile-253808.html. Helou, A. (2014, May 24). MOVE OVER BROCCOLI, CAULIFLOWER IS THE NEWEST SUPERFOOD. Retrieved from http://www.newsweek.com/2014/05/30/move-over-broccoli-cauliflower-newest-superfood-251878.html. Hodeib, M. (2014, Septemer 24). Anissa Helou: the elegant chef. Retrieved from http://www.dailystar.com.lb/Life/Lubnan/2014/Sep-24/271726-anissa-helou-the-elegant-chef.ashx. Jalil, X. (2016, February 9). Women to take centre stage at LLF 2016. Retrieved from http://images.dawn.com/news/1174798. Martha Stewart. (2016). Cooking Turkish Meat Bread with Lamb. Retrieved from http://www.marthastewart.com/910372/cooking-turkish-meat-bread-lamb. Martha Stewart. (2016). Moroccan-Style Stuff Bread. Retrieved from http://www.marthastewart.com/910371/moroccan-style-stuffed-mussels. O’Sullivan, E. (2014, May 3). Anissa Helou’s Laster Supper. Retrieved from http://www.theguardian.com/lifeandstyle/2014/may/03/anissa-helou-last-supper-stuffed-chard-recipe. Robinson, W. (2014, October 03). Chef Anissa Helou’s Expert Tips on What to Do in Abu Dhabi. Retrieved from http://www.cntraveler.com/stories/2014-10-03/chef-anissa-helou-s-expert-tips-on-what-to-do-in-abu-dhabi. Sarfraz, E. (2016, February 21). All about freedom of expression. Retrieved from http://nation.com.pk/national/21-Feb-2016/all-about-freedom-of-expression. Shaukat, A. (2016, February 22). Garnish cooking with research, experiment. Retrieved from http://tribune.com.pk/story/1051748/garnish-cooking-with-research-experiment/. The World Bank. (2016). Middle East and North Africa. Retrieved from http://www.worldbank.org/en/region/mena. (2016). @anissahelou. Retrieved from https://twitter.com/anissahelou. Wood, S. (2013, October 15). The food writer Anissa Helou on her new cookbook, Levant. Retrieved from http://www.thenational.ae/lifestyle/food/the-food-writer-anissa-helou-on-her-new-cookbook-levant. Yang, W. (2014, July 5). First Stop: Anissa Helou’s Istanbul. Retrieved from http://www.culinarybackstreets.com/istanbul/2014/first-stop-10/. Chef; Cooking Instructor; Culinary Researcher; Food Consultant; Food Writer, Middle Eastern Cuisine; Writer. Individual Publication Date: July 22, 2018: www.in-sightjournal.com/helou-one; Full Issue Publication Date: September 1, 2018: https://in-sightjournal.com/insight-issues/. Photograph courtesy of Anissa Helou. Helou, A. (2016). About. Retrieved from http://www.anissas.com/about/. In the spring of 1999, she decided to change the course of her life. There were no half measures. She sold her house and put her remarkable and idiosyncratic collections up for sale at Christie’s. In the introduction to the catalogue the celebrated art historian and jazz singer, George Melly, described his arrival at her house to dine and to inspect the objects for sale:?‘when the taxi drew up she heard it and through the open door she stood in silhouette instantly recognised by her totally unique ‘coiffure’, an inadequately dainty word for this explosion with its dramatic white streak; the nearest equivalent is in fact that of Elsa Lanchester in ‘The Bride of Frankenstein’. Nothing scary about Miss Helou though. Her hair is more like the personification of her amazing energy. Her smile is as friendly as you can get. She is as lithe as an athlete. American Medical Association (AMA): Jacobsen S. An Interview with Anissa Helou (Part Two) [Online].August 2018; 17(A). Available from: www.in-sightjournal.com/helou-two. American Psychological Association (APA, 6th Edition, 2010): Jacobsen, S.D. (2018, August 1). An Interview with Anissa Helou (Part Two). Retrieved from www.in-sightjournal.com/helou-two. Brazilian National Standards (ABNT): JACOBSEN, S. An Interview with Anissa Helou (Part Two). In-Sight: Independent Interview-Based Journal. 17.A, August. 2018. <www.in-sightjournal.com/helou-two>. Chicago/Turabian, Author-Date (16th Edition): Jacobsen, Scott. 2018. “An Interview with Anissa Helou (Part Two).” In-Sight: Independent Interview-Based Journal. 17.A. www.in-sightjournal.com/helou-two. Chicago/Turabian, Humanities (16th Edition): Jacobsen, Scott “An Interview with Anissa Helou (Part Two).” In-Sight: Independent Interview-Based Journal. 17.A (August 2018). www.in-sightjournal.com/helou-two. Harvard: Jacobsen, S. 2018, ‘An Interview with Anissa Helou (Part Two)‘, In-Sight: Independent Interview-Based Journal, vol. 17.A. Available from: <www.in-sightjournal.com/helou-two>. Harvard, Australian: Jacobsen, S. 2018, ‘An Interview with Anissa Helou (Part Two)‘, In-Sight: Independent Interview-Based Journal, vol. 17.A., www.in-sightjournal.com/helou-two. Modern Language Association (MLA, 7th Edition, 2009): Scott D. Jacobsen. “An Interview with Anissa Helou (Part Two).” In-Sight: Independent Interview-Based Journal 17.A (2018):August. 2018. Web. <www.in-sightjournal.com/helou-two>. Vancouver/ICMJE: Jacobsen S. An Interview with Anissa Helou (Part Two) [Internet]. (2018, August; 17(A). Available from: www.in-sightjournal.com/helou-two.